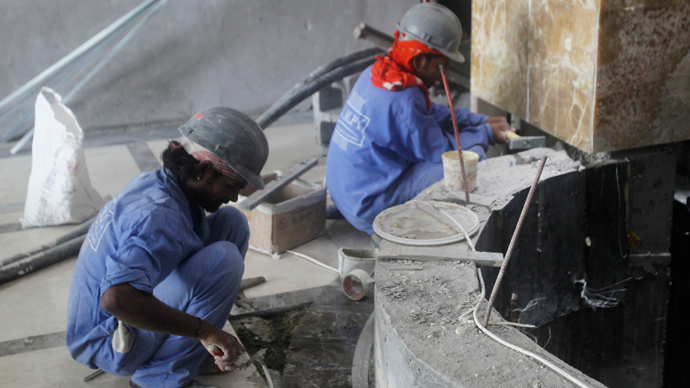 More than 450 Indian migrant workers in Qatar have died in the last two years, media revealed on Monday. Another upcoming report will show that 400 Nepalese have lost their lives scrambling to get the Gulf state ready for the 2022 World cup. At least 237 Indian migrants lost their lives in Qatar in 2012 and another 218 in 2013 up to December 5, AFP reported on Monday, citing figures received via a Right to Information request filed at the Indian embassy in Qatar. On average, 20 Indian migrants die per month in Qatar. August last year was the most deadly month on record, with 27 fatalities being reported. The Indian embassy did not provide information regarding the causes of death or where they occurred. It also declined to disclose any correspondence between the diplomatic mission and the Indian government regarding the treatment of its nationals in the Gulf state. Meanwhile, figures set to be released later this week say that 400 Nepalese workers have died at building sites since construction for the World Cup 2022 got underway in 2010, the Guardian reports. The Guardian did not state when the deaths occurred, but said that the Pravasi Nepali Co-ordination Committee, a respected human rights organization, which reached its figure using official sources in Doha, would release more information in the coming days. There were 500,000 Indians estimated to be in Qatar at the end of 2012 – roughly 26 percent of Qatar’s population. 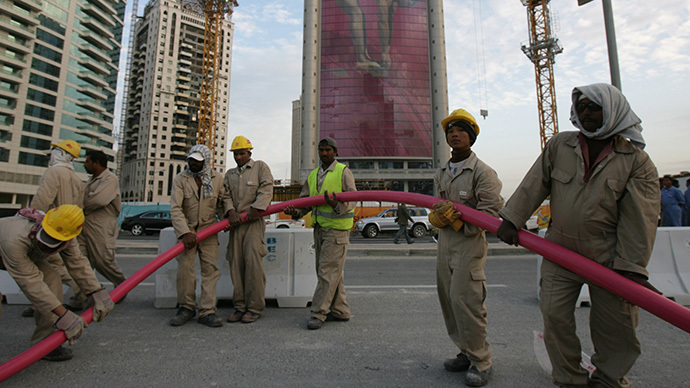 Nepalese workers comprise approximately 20 percent of Qatar's migrant workforce and 16 percent of the total population. The total death toll stemming from the country’s World Cup scramble could in fact be higher, as other migrant groups are also present in the country. As of January 2012, Bangladeshis, Pakistanis and Sri Lankans together accounted for 14 percent of the emirate’s population, according to US State Department figures. On February 11, Qatar issued detailed guidelines intended to protect the country’s massive expatriate community from exploitation and stem the intensified international criticism on its human rights record. Activists, however, believe the number of dead could swell to 4,000 by the time the 2022 World Cup kicks off. On Thursday, FIFA said there was little it could do to alleviate the slave labor conditions migrants are toiling under in the country. In September, The United Nations condemned Qatar for failing to comply with an international convention banning the use of forced labor.